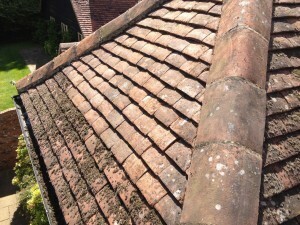 We have a reputation for providing the best roof cleaning Reigate has to offer. This is a service that can increase the life of the roof of your property. It can also transform how it looks, improving the kerb appeal. How Do You Care For A Roof? Many people do not even consider roof cleaning as they don’t realise that it is essential. The main purpose is to deal with moss and lichen build-up. This is one of the most common causes of roof damage. The organic growths can eat at the surface of your tiles and leave dark stains which result in heat damage. They also absorb water, causing more wear and even displacing materials when it freezes and expands. Our cleaning methods are manual, gentle, and highly effective. More importantly, they are better than high-powered pressure washing. This damages and marks the tiles as well as risking water flooding into the loft. Instead of this, we remove the substances carefully by scraping the tiles. Then, we apply a biocide to attend to any traces of moss, lichen, and other organic growths for a finish that lasts. This will allow you to continue enjoying the look without the worry of needing someone to come and do it again soon. Moss growths can shorten the life of your roof and risks water damage to your property. Regular cleaning will attend to this and also give it an amazing aesthetic finish. You won’t have to live with a dirty looking roof. Many people see a substantial difference in the colour. We also offer driveway, patio and gutter cleaning across Reigate. That means you can choose a package of services to make sure everything looks and functions properly. From start to finish, Surrey Roof & Gutter Clean will give your roof the care it needs. We also aim for complete customer satisfaction with every job. Don’t worry if you are unsure about the state of your roof and the work it needs; we offer a free, 15 minute, no-obligation quote. Contact us to benefit from the reputable and reliable roof cleaning Reigate home owners can trust. We are confident you will love the results.